Fly fishing is an angling method in which an artificial ‘fly’ is used to catch fish. The fly is cast using a fly rod, reel, and specialized weighted line. Casting a nearly weightless fly or ‘lure’ requires casting techniques significantly different from other forms of casting. Fly fishermen use hand tied flies that resemble natural invertebrates or other food organisms, or ‘lures’ to provoke the fish to strike. In the late 19th century, American anglers, such as Theodore Gordon, in the Catskill Mountains of New York began using fly tackle to fish the region’s many brook trout-rich streams such as the Beaverkill and Willowemoc Creek. Many of these early American fly anglers also developed new fly patterns and wrote extensively about their sport, increasing the popularity of fly fishing in the region and in the United States as a whole. One such man was Charles F. Orvis, who through his actions helped to popularize fly fishing by designing and distributing novel reel and fly designs. His 1874 fly reel was described by reel historian Jim Brown as the “benchmark of American reel design,” the first fully modern fly reel.The founding of The Orvis Company helped institutionalize fly fishing within America and supplied angling equipment and accessories to the homes of millions of Americans. His tackle catalogs, distributed to a small but devoted customer list in the late 1800s, are now highly collectible as early forerunners of today’s enormous direct-mail outdoor products industry. The Junction Pool in Roscoe, where the Willowemoc flows into the Beaver Kill, is the center of an almost ritual pilgrimage every April 1, when the season begins. Albert Bigelow Paine, a New England author, wrote about fly fishing in The Tent Dwellers, a book about a three week trip he and a friend took to central Nova Scotia in 1908. 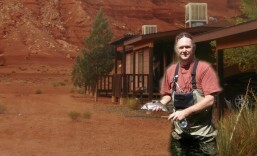 In recent years, interest in fly fishing has surged as baby boomers have discovered the sport. Movies such as Robert Redford’s film A River Runs Through It, starring Craig Sheffer and Brad Pitt, cable fishing shows, and the emergence of a competitive fly casting circuit have also added to the sport’s visibility. In order to deceive wary trout, or to reach deep runs where he/she believes salmon lie, the fly angler often needs to wade to the right casting position. He/she therefore requires sure footing and insulation from cold water, both provided by hip boots or chest-high waders. The latter are of two main types, one-piece “boot foot” waders and “stocking foot” waders, which require external boots. Formerly of latex rubber, “stocking foot” waders now are made of neoprene, usually 3 mm thick, which provide additional warmth. In the mid-20th century American anglers developed felt boot soles for a better grip in rocky rivers: but felt is now prohibited in some US states, as a vector of fish and plant diseases that damage sport fisheries. Manufacturers now offer wading boots with special rubber treads or metal studs. Breathable Gore-Tex waders provide ventilation when hiking along the water, but do not provide flotation in the event of slipping or falling into deep water. In deep water streams, an inflatable personal flotation device (PFD), or a Type III Kayak fishing vest, adds a degree of safety. Some “catch and release” anglers flatten the barb of their hook. Such “barbless hooks” are much easier to remove from the fish (and from the angler, in the event of mishap). Many rivers with special regulations mandate that fishermen use barbless hooks in an effort to conserve a healthy fish population. Dry fly fishing is done with line and flies that float, joined by a leader, usually made of fine polyamide monofilament line. The tapered leader is 3 to 5 meters long, thus nearly invisible where the fly is knotted, and the angler can replace the last meter of nylon as required. Unlike sinking fly (nymph) fishing, the “take” on dry flies is visible, explosive and exciting. While trout typically consume about 90% of their diet from below-water sources, the 10% of surface-level consumption by trout is more than enough to keep most anglers busy. Additionally, beginning fly anglers generally prefer dry fly fishing because of the relative ease of detecting a strike and the instant gratification of seeing a trout strike their fly. Nymph fishing may be more productive, but dry fly anglers soon become addicted to the surface strike. Dry flies may be “attractors”, such as the Royal Wulff, or “natural imitators”, such as the elk hair caddis, a caddisfly imitation. A beginner may wish to begin with a fly that is easy to see such as a Royal Wulff attractor or a mayfly imitation such as a Parachute Adams. The “parachute” on the Parachute Adams makes the fly land as softly as a natural on the water and has the added benefit of making the fly very visible from the surface. Being able to see the fly is especially helpful to the beginner. The fly should land softly, as if dropped onto the water, with the leader fully extended from the fly line. Due to rivers having faster and slower currents often running side by side, the fly can over take or be overtaken by the line, thus disturbing the fly’s drift. Mending is a technique whereby one lifts and moves the part of the line that requires re-aligning with the fly’s drift, thus extending the drag free drift. The mend can be upstream or down stream depending on the currents carrying the line or fly. To be effective, any mending of the fly line should not disturb the natural drift of the fly. Learning to mend is often much easier if the angler can see the fly. Once a fish has been caught and landed, the fly may no longer float well. A fly can sometimes be dried and made to float again by “false” casting, casting the fly back and forth in the air. In some cases, the fly can be dried with a small piece of reusable absorbent towel, an amadou patch or chamois and after drying placed and shaken in a container full of fly “dressing”; a hydrophobic solution. A popular solution to a dry fly which refuses to float is simply to replace it with another, similar or identical fly until the original can fully dry, rotating through a set of flies. Dry fly fishing on small, clear-water streams can be especially productive if the angler stays as low to the ground and as far from the bank as possible, moving upstream with stealth. Trout tend to face upstream and most of their food is carried to them on the current. For this reason, the fish’s attention is normally focused into the current; most anglers move and fish “into the current”, fishing from a position downstream of the fish’s suspected lie. Trout tend to strike their food at current “edges”, where faster- and slower-moving waters mix. Obstructions to the stream flow, such as large rocks or nearby pools, provide a “low energy” environment where fish sit and wait for food without expending much energy. Casting upstream to the “edge” of the slower water, the angler can see the fly land and drift slowly back downstream. The challenge in stream fishing is placing the fly with deadly accuracy, within inches of a protective rock for instance, not long range casting. Done properly, the fly seems to be just floating along in the current with a “perfect drift” as if not connected to the fly line. The angler must remain vigilant for the “take” in order to be ready to raise the rod tip and set the hook. Trout tend mostly to feed underwater. Especially when fishing deeper waters such as rivers or lakes, putting a fly down to the trout may be more successful than fishing on the surface, especially in the absence of any surface insect activity or hatch. The nymph itself can be weighted, as is the popular bead headed hare’s ear nymph or bead headed pheasant tail nymph. Alternatively, the angler can use an attractor pattern such as a Prince Nymph. Weights can be added to the leader. Probably the best weight to use is twist on lead or other metal strips because it has a much less detrimental effect on the casting ability. A sinking tip fly line can also serve to sink the fly. The most common nymphing and general overall fly fishing technique that even beginners can master is a “dead drift” or tight line fishing technique, casting directly across the river, letting the fly line drift downriver while keeping any slack out of the line. If the Nymph is drifting too fast then you should perform an upstream mend. If the nymph is drifting too slowly you should mend downstream. A beginner need simply to point the rod at the fly, lifting the rod in the event of a strike. This is a “downstream technique”, where the angler moves in a downstream direction. More advanced techniques make use of a highly visible strike indicator attached to the leader above the sinking fly. In New Zealand, nymphing has become the dominant form of fishing in rivers such as the Tongariro, and a technique involving a high visibility indicator, and 2 nymphs tied in short succession (a weighted nymph and a 2nd often unweighted nymph) means the chances of getting a fly into deeper water with a fly that still moves naturally increases. It is also possible to use standard sinking fly lines. Especially if the current is strong and if it is difficult to get down to the correct level to catch the trout. Fishing for trout in lakes requires different tactics. A canoe, pontoon boat or a float tube allows an angler to cover a lot more water than waders. Trout may congregate in cooler water near an inflowing stream or an underwater spring and may be lured to bite on a streamer fly. An often successful tactic is to pull a streamer such as a woolly bugger using clear sinking line, behind the watercraft. The somewhat erratic motion of the oars or fins tends to give the streamer an enticing action. Trout also tend to “cruise” transitional areas (e.g. dropoffs, weed bed edges, subsurface river flow at inlets, etc.) Watching for cruising trout and casting well ahead of any visible fish is often successful. 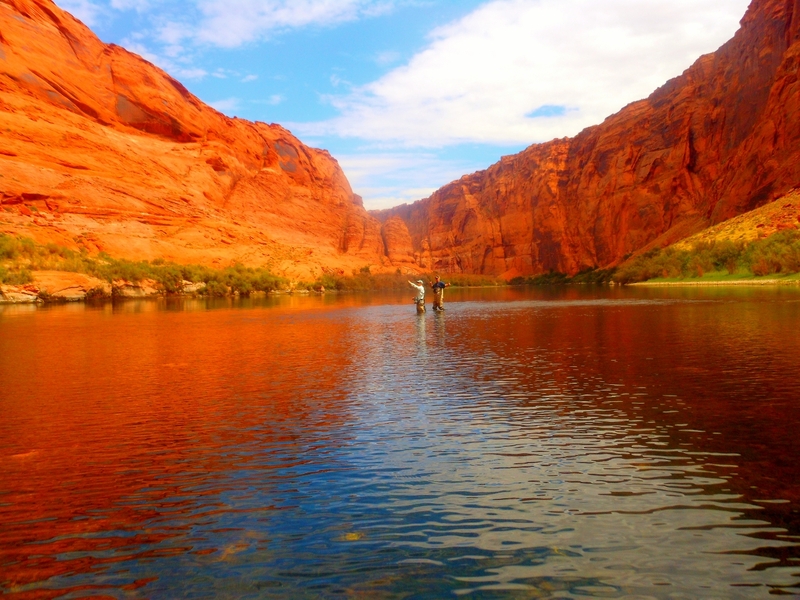 Surprisingly AZ has a lot of nice fisheries. Check out my Lees Ferry Post it has a lot of good info and pictures. I used to be all about the rivers and streams but have taken up streamer fishing lately using personnel pontoons on the high country lakes and it is a lot of fun.